For the past year or so, I’ve been telling myself I’m going to write an awesome review for the folks at CFMAF. Each time I sit down and write something out, I find myself editing and re-editing because I just cant seem to find the words to express just how truly amazing CFMAF, their staff, the training, and the family really are! Let me start by saying that I have been training with Master Isaac Costley at CFMAF since April of 2014. Our paths crossed after I returned from my third combat deployment to Afghanistan. After perusing the interwebs in search of a quality martial arts experience, I had 3 simple requirements: The first, a practical self-defense style that focuses more on real world scenarios rather than the pretty jump kicks, forms, and katas that a majority of schools specialize in. After training in Karate in my youth, I was subjected and taught some forms and katas that I just didn’t understand. I merely memorized some movements and did punch-punch, kick-kick to earn my next rank. Knowing what I know now, I can see there is a purpose behind that, but I certainly didn’t understand it at the time. For real life, on the street, these forms and katas are very impractical. At CFMAF, they don’t focus on that but rather explaining and demonstrating what techniques are effective for the street, and which techniques are merely part of the Art. The second requirement for me was to find a school that didn’t focus on producing black belts. At 7 of the local schools that I checked out, they claimed that I could be a black belt in ‘X’ amount of years. Master C never mentioned the progression to get to black belt during our first visit. Instead, he equipped me with enough knowledge to do my own research. I found out that in Master C’s decades of teaching experience, he had only promoted 16 (at the time) people to the rank of first degree black belt – something he wears as a badge of honor. This told me right away that he cares more about developing a person as a whole, ensuring their techniques and fundamentals are on the level of a black belt, and engraining quality leadership skills more than giving people belts. At CFMAF, belt ranks are earned, never given. Too many people focus on what color belt they wear around their waist instead of what is truly important. I remember watching some demonstrations at other local schools and watching their black belts perform their forms. I wasn’t impressed. In fact, at CFMAF, we are taught at very junior levels not just techniques, but appropriate application of those techniques in given situations. Master C and the instructors at CFMAF do a great job of teaching concepts and allow their students to develop their own critical thinking skills that just might be the difference between life and death in the real world. The third requirement for me was flexibility and cost. Of the schools that checked out, there were certainly schools that were ‘cheaper,’ and some that were more expensive. My first reaction was of course to take the cheapest route; but, those were the schools that overcrowded, offered little to no personal attention from the instructors, and just simply didn’t care about their students. They were all about the bottom line and making money. The more expensive schools I explored clearly showed where the money was going. The owners were driving fancy cars, they had vacations written out on the school’s calendar, and they put their money into décor for the school. None of these schools had their own gym with free weights and machines, none of them had extra equipment for students to use, and only two of the schools even had bags and pads to use. CFMAF offers more than just self-defense instruction. They offer a full line of workout equipment, certified personal trainers on staff, quality morals and values, discipline and work ethic, and even friendly advice and guidance. The instructor staff there may only be paid for the time instructing, but they are so much more. They are mentors. I have witnessed children who lack discipline and direction come in to CFMAF and watch them turn in to respectable citizens who will be a positive contribution to society. That is something we don’t pay them to do, but something I have seen them do time and time again. I chose CFMAF because I saw the value of what I was paying for. Frankly, I’m surprised they don’t charge more than they do – they certainly deserve more. Additionally, they are constantly giving back to the community and their students. I remember them offering free training for an entire month to the local community; they periodically host free seminars for women’s self defense, anti-abduction clinics, summer safety classes, back to school classes, and the like – ABSOLUTELY FREE! Ladies and Gentlemen, I cant imagine putting myself through that kind of stress on a regular basis without being paid for it. They genuinely care about the safety of our community and continue to amaze even me. They even visit local elementary schools in district 11 on a regular basis to teach students the dangers of the real world and how to avoid nasty situations, but in the event they find themselves in one, they are equipped to defend themselves and attract attention to the situation. Simply amazing! For their students, CFMAF often has free give aways: trips to Las Vegas for free, bicycles, video game consoles, and even a back to school picnic every year completely free to the students. I did not find another school in the area that offered anything even remotely close to that. Finally, the students at CFMAF are more than just another face I see twice a week. Some have become great friends. We treat eachother with dignity and respect regardless of our different backgrounds. We have members from all walks of life, different races, ethnicities, and religions. We even have disabled students and students with certain limitations. No worries though, the staff is knowledgeable enough and willing to adapt our curriculum to what they are capable of doing. Don’t feel discouraged because you may half to walk with a cane, or stuck in a wheel chair. You can still prepare yourself for the real world and learn potentially life saving techniques regardless of your capabilities. To Master Costley and Mrs. Heather, I sincerely appreciate everything you have done not only for me and my family, but for the community and your students. You are an inspiration and exhibit qualities that I admire and will continue to strive to mimic. I have learned so much from both of you and your staff over the past few years and look forward to many many more. “Over the past two years, Master C has transformed my body and mind into a lean mean machine that has increased my self confidence and has given me the ability to defend myself and my family if I ever need to. CFMA is also family oriented environment where kids and their parents can participate together, and I have seen tremendous confidence and perseverance from my boys as a result of instruction at CFMA. “I am a 34 year old married, father of a 5yr old and 4yr old (boy & girl) who is very concerned about their safety as well as my wife – simply for the fact we live in an unpredictable world. I’m also out of shape with poor conditioning after years of sedentary office/computer work. Martial Arts has always been intriguing to me but I’ve never been exposed to it and, at 34, was a bit hesitant to subject myself to something more physically demanding than I could handle. I have been pleasantly surprised by Master Isaac Costley (“Master C”) and Instructor Heather Anderson who have both shown patience and interest in the development of my children as well as my wife and me. 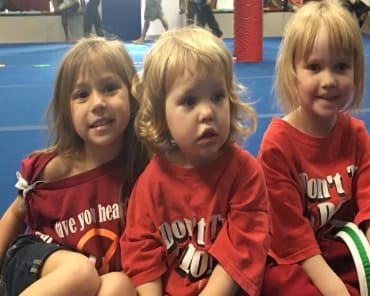 The Little Dragons class for the children teaches core values such as responsibility, integrity, discipline, attentiveness (just to name a few) coupled with safety, awareness, and self-defense. While true teaching of these values should come from the home, The Little Dragons curriculum reinforces this with reality-based lessons that are exciting and fun for the children. My children look forward to each class! My wife and I couldn’t be happier attending our classes MWF – we are getting back into shape while learning how to defend ourselves. I’ve enjoyed a new sense of purpose as I work toward goals and achievements that tend not to exist otherwise in the adult working world. I would recommend Calvary Family Martial Arts & Fitness to anyone looking to improve their health, develop skills they never knew they had, once again enjoy working toward goals, and to begin walking confidently in the real world. Thank you Master C and Instructor Heather! “My son transferred to Calvary Family Martial Arts and Fitness six months ago……and although leery about what this change would mean for him coming into a new school and for me with the change in dates, time and location it has proved to be a move worth the extra effort. Master C and his team have done a wonderful job in making everyone feel so welcomed and takes a special interest in each child or adult individually, which has meant a lot. The children’s Hybrid Hapkido class has proven to be an exceptional program for my eight year old son and he has transitioned very well into it. I am please to know that the training he’s receiving at Calvary Martial Arts and Fitness is preparing him for something far greater than martial arts, but for life. Calvary Family Martial Arts has done a great job in ensuring everyone feels just that…..a part of the “family” as they go above and beyond by offering a variety of unique classes where the whole family can participate and in breaking away from the old and exploring new ways to bring the families together thru other activities outside of martial arts and fitness classes. So, my leeriness has since grown to thankfulness for Master C and his team for offering the highest quality of martial arts and fitness training in the Colorado Springs area and their dedication to see each person in each class succeed mentally, physically and spiritually. Anyway, I was reminded of that tonight in class when I brought Sarah. She is not a crazy athlete like our friend Ms. Katie, but she is a wonderful person with a great attitude and is also having a hard time in life at the moment. I really encouraged her to come with me to class tonight, and on the way home she was just beaming… she was as happy as I have seen her in weeks. I mean we could start a motto here… “hybrid Hapkido: better than therapy”.